Many talented illustrators develop a style, find an audience, and enjoy a long, successful career catering to that audience. But there is a special place in my heart for illustrators who take their initial success and re-invest it in new challenges. In my view, that's the highest use for success. Greg Manchess could easily have joined this prosperous gang. Some contemporary illustrators have done well by repeating variations on pin up girl motifs. Their creative challenges seem limited to whether the girl will be wearing a black corset or a red corset in the next picture. 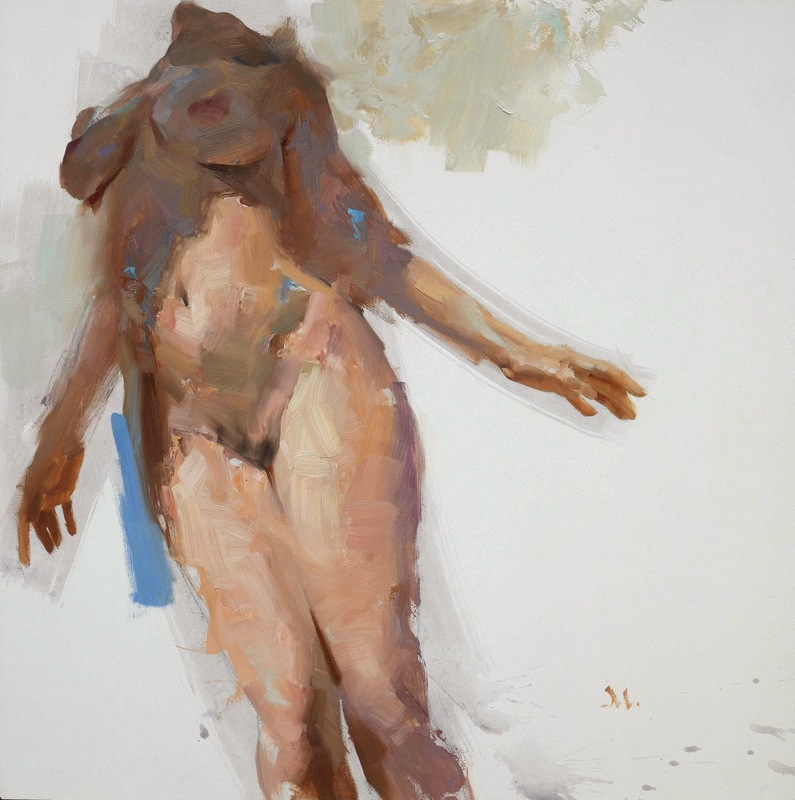 By contrast, Manchess opens himself up to the full range of issues presented by legitimate figure painting. By making his next job harder rather than easier, Manchess continues to mature as a painter at a time when many others are content to rest on successful recipes. Ralph Waldo Emerson urged young artists and poets not to be content with the "low prudence" of success. He said, "If ...God have called any of you to explore truth and beauty.... [e]xplore and explore. Be neither chided nor flattered out of your position of perpetual inquiry." Was that so hard? You bet your sweet pumpkin it’s hard. This is Creativity, remember? It doesn’t come all shiny new out of a box." Manchess has incredibly grown as a painter. He never gets stale. He's a great guy also. 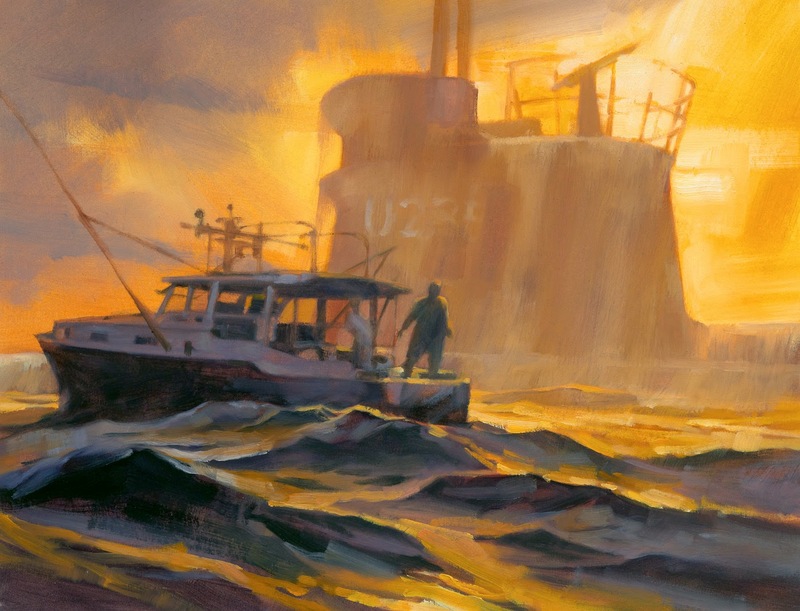 I don't get to New York often any more, but really lucked out last fall when, on a layover on a flight from Paris, I was able to catch an exhibition of Manchess' work at the Society of Illustrators on East 63rd Street. You really have to see his paint handling style in person to get the full impact (even though reproductions of it are pretty good these days). 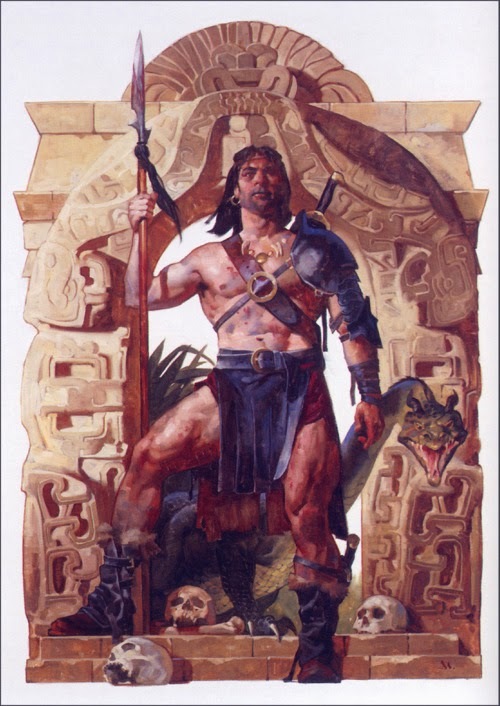 In a totally different stylistic way, I find him to be this generation's version of Bernie Fuchs, and download every example of his work I can (like I do with Fuchs). This is a whole new Manchess. Thanks for posting. David what are the names of the epidemic of bad artists? Manchess, to me, is one of the very few current artists that could have been competitive in the golden age. 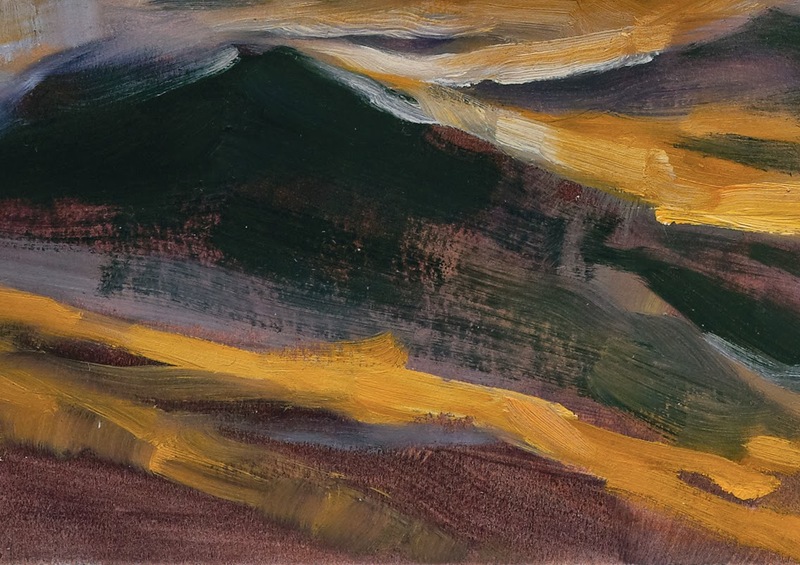 I like these painterly experiments he's been doing. I assume they are designed to appeal to illustration clients outside the fantasy field. 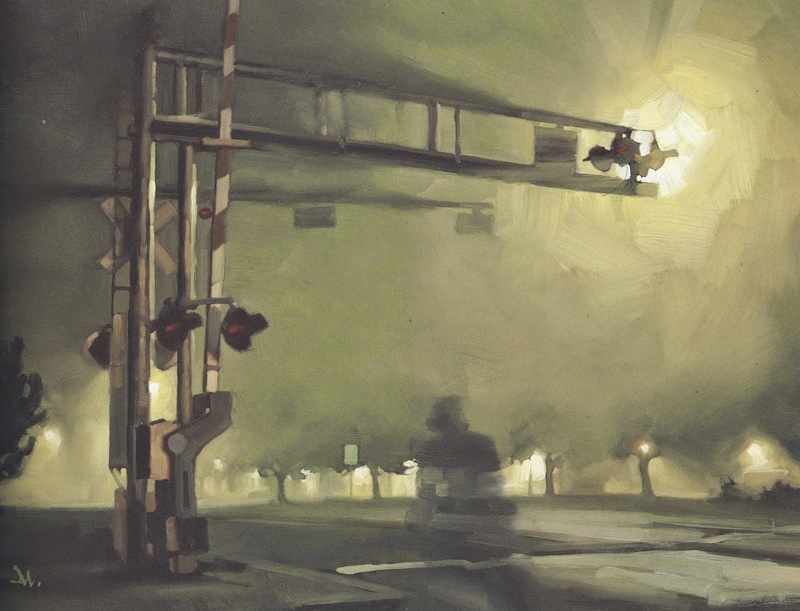 I saw him paint a few years ago at the Society of Illustrators and it was quite a treat. He had transferred a crisp outline/underdrawing onto a gray toned canvas mounted on board. And, with his ref nearby, he painted the painting (of cavaliers in a Tudor town) unremittingly throughout the day. He paused often to think, but I didn't note a single moment of doubt; nothing was changed once the paint landed on the piece, and nothing was significantly rethought from his original conception of the design. I remember reading an interview with him, maybe 20 years ago, in some newsprint handout given away at comic shops. The quote that always stuck with me was; "Nobody talks about composition anymore." MORAN-- I agree. There are a lot of temptations for an artist to produce work on an assembly line. It's always a pleasure to come across an artist who believes he still has important decisions ahead of him. Donald Pittenger-- I missed that show, but I heard it was good. I have seen a couple of Manchess' originals now, and I agree that it adds a lot. JSL-- You guys are welcome to submit your own candidates. For purposes of my point here, all that's necessary is that people recognize the phenomenon exists. I don't think there's any controversy about that. Kev Ferrara-- Thanks for the description. I could tell from the result that Manchess is not one of those who slides paint around the canvas hoping for happy accidents. His accents are too strategically placed, his priorities are too thoughtful. I agree with you about the golden age comparison, although I don't know many artists from that era who would have felt free to make some of Manchess' more extreme statements. For example, on the close up of the deep sea diver, those bright red marks that would be so out of place in nature, or the liberties he took with the forms of the fish. Do you think golden age audiences were ready for that? That's a great quote at the end there. Good post. For example, on the close up of the deep sea diver, those bright red marks that would be so out of place in nature, or the liberties he took with the forms of the fish. Do you think golden age audiences were ready for that? Re Kev: I'm inclined to agree. A hundred years ago, color printing technology for magazines could cover up subtle color-related details (not quite so for book illustrations that got more care). So that factor might affect how we evaluate illustrations from that time. What is interesting is to see some of the original artwork. Take N.C. Wyeth, Pyle's star student. A number of his 1914-vintage paintings have areas built up from more than one color , Impressionist-style. And Rockwell. At an exhibit, I noticed bits of something like turquoise blue mixed into skin tones. These touches might or might not have survived the transfer to print even by the 1940s. 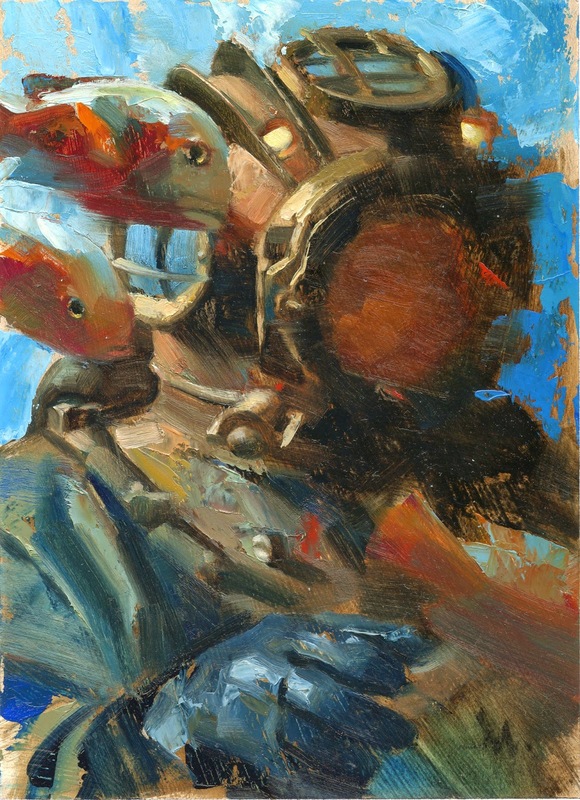 Oh, and those helmet studies by Manchess are also small and experimental. It takes a hunk of skill to paint so freely so well. Have you considered selling your illustrations online ? I do not like you, Spam I am. Conor Hughes-- Yes, I recommend following the link to his column on Muddy Colors. A lot of great advice. Kev Ferrara-- That sounds right to me. Donald Pittenger-- I agree. 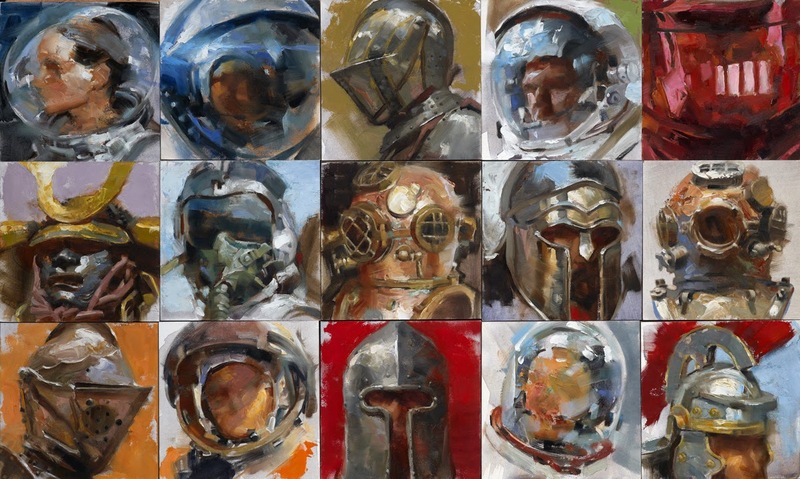 Manchess seems to have a thing for helmets right now, but these studies really seem to pay off. JSL-- I won't comment on specific names, but I could make a list four times as long. Fabien Dormoy-- I try to eliminate comments from robots, but have been away for a few days. Since people have had some fun responding, I'll leave this up. Anonymous and Cory Hinman-- Yeah, well, you can't take this kind of thing too seriously. Some day before I close this thing down I'll do a "greatest hits" of spam. Richard-- Yes, he's pretty impressive, isn't he? It's nice to see what a difference backbone and integrity can make. 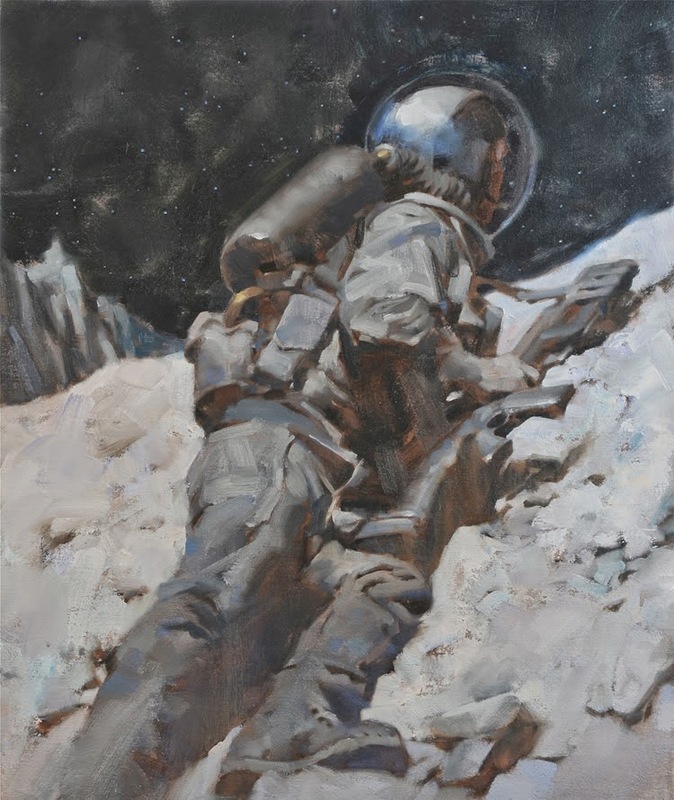 Manchess is one of my favorite painters of the last 15 years or so, easily. You are right, he continues to experiment, to distill, to hone down to what counts. His sketches are a real learning experience. Missed seeing this blog, David..moved and lost the link…and got lazy, I guess. Glad to be back!